Leaving cold Germany for warm Buenos Aires was bittersweet. It meant the last leg of our eight month rtw trip. The kids happily left the winter coats that no longer reached their wrists in the airport…Julia’s discretely hanging from the hook in a restroom stall and Sean’s wrapped in a blanket and shoved under his seat on the plane. Their dollar-store winter boots sat abandoned in the Munich hotel room we departed from that morning. And with good reason. Buenos Aires, in the height of its summer, was a sauna. After a 14-hour flight, we made our way to a lovely Palermo loft apartment that we would be sharing with my father and wicked (ly loved) stepmother who were joining us for two weeks in the Paris of South America. South America seemed an appropriate place to spend our final three months…it blended the grit, vibrancy and laissez faire attitude of SE Asia with the customs, architecture and conveniences of Europe. Of course, it was a unique experience unto its own but it carried a balance of where we’d been. And we liked that. In each new local there’s an arrival dance we do to ensure comfort…how will we brew coffee? Where is the nearest grocery? What is soy milk called in Spanish? What is the tipping policy? Exchange rate? Laundromat? On a vacation, one generally researches prior to stepping off the plane. But on an rtw, the longer we travel, the more relaxed our attitude is to figure out the details upon landing. I had once been fluent in Spanish, having lived a year of my youth in Mexico, and hoped it would quickly resurface from my subconscious and make the dance less clumsy. Sean and Julia, too giddy to sleep, at the impending arrival of their grandparents. Our first ride on a Buenos Aires bus…the retro style made me feel like I had finally made it to Cuba. 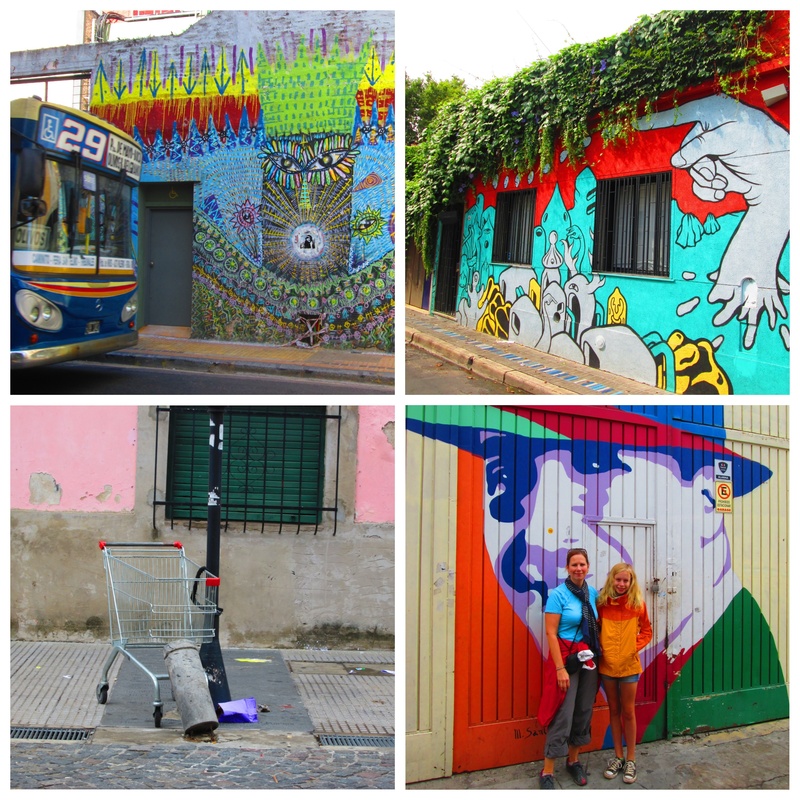 The funky street art of San Telmo and the pulsing creative energy it inspires. 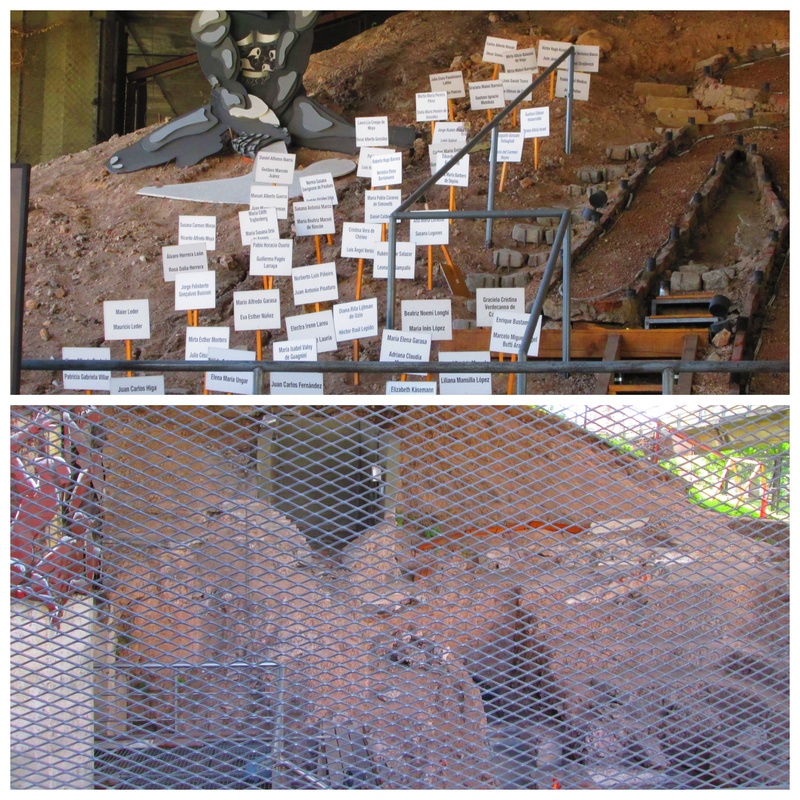 Witnessing the evidence of the 30,000+ young desaparecidos — a reminder of what happens when power = control at any cost. 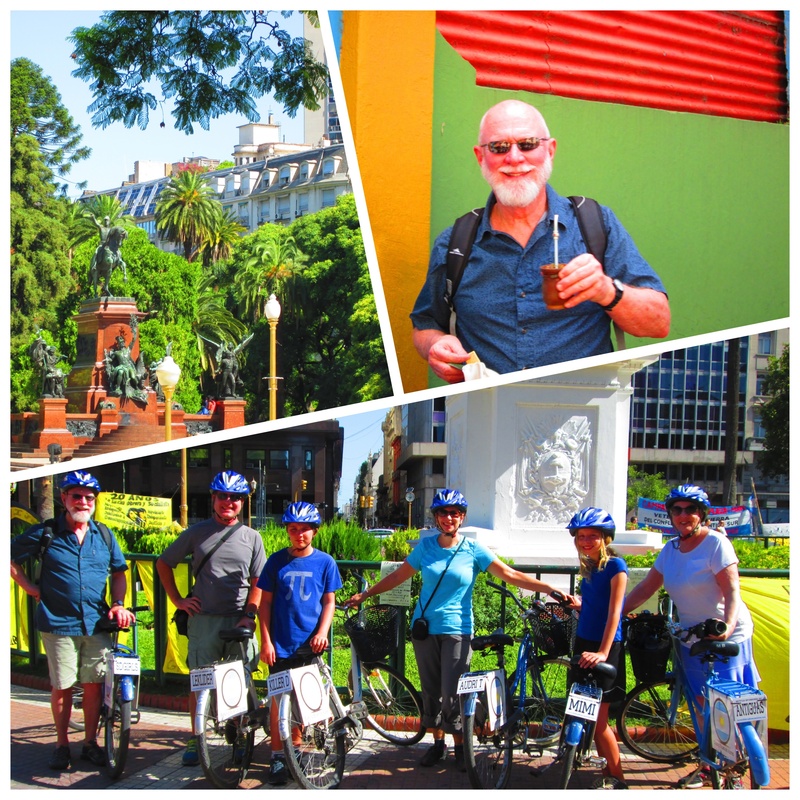 Our wonderful tour with Jonathan Evans of Local Tours…standing in the Plaza de Mayo where mothers and grandmothers march weekly in white handkerchiefs in remembrance and protest of the lost children and grandchildren. 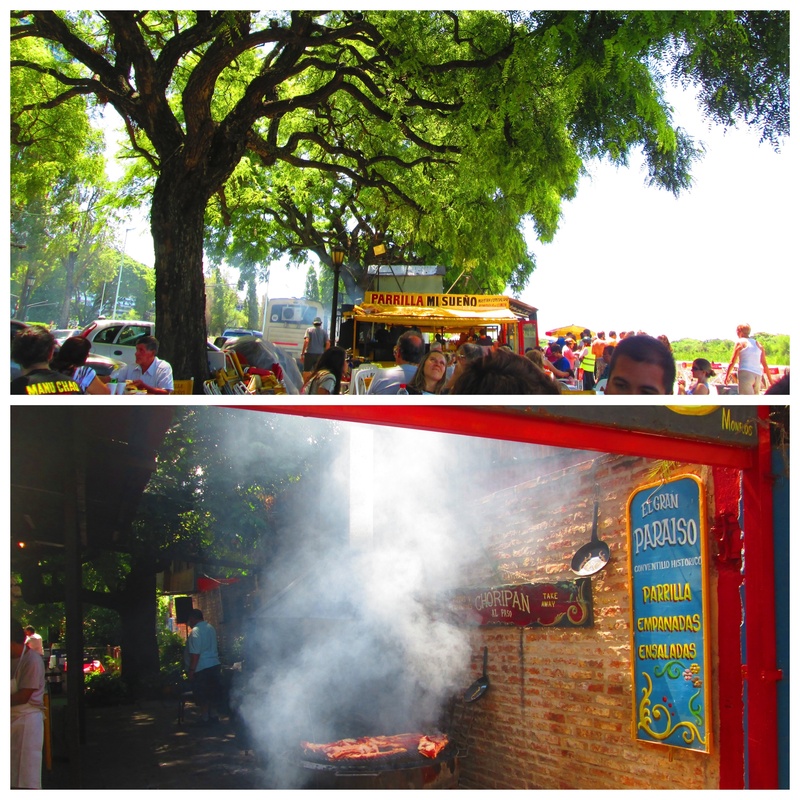 My first taste of a parrilla and empanada in the streets of Buenos Aires. Our multi-generational bike ride through the ecologia reserve, an enormous expanse of biodiversity set along the might-as-well-be-an-ocean Rio Plata. The daily discoveries of hidden delights in the form of cafes and small retail shops of unique wares down quaint cobblestone alleyways in Palermo Viejo. Our first sips of maté as a family as we passed the single cup of tea around. And the promise of sun, good food and laughter with family for many days to come. 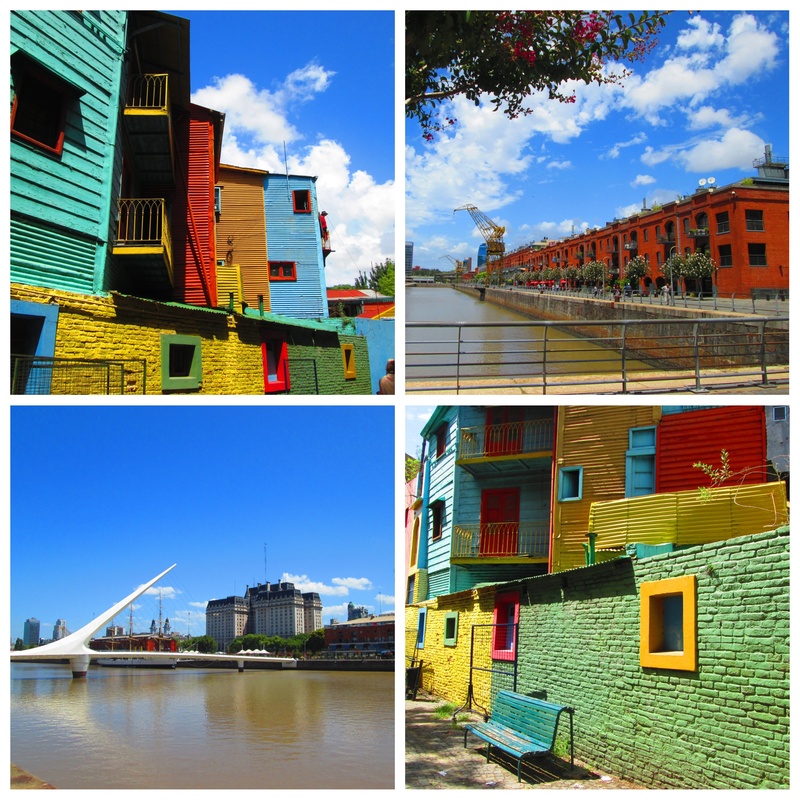 The vibrant colors are wonderful….enjoy South America and the precious time with your family. great colours! I’m looking forward to reading more – always wanted to visit Argentina. Such beautiful & happy colors! Looking good Bruce & Maggie–enjoy your wonderful family time and adventures in the warm sunshine!